Most recently in our series, we have been talking about the War of Eighteen Twelve between the United States and Britain. In the summer of eighteen fourteen, the two countries opened peace talks at Ghent, in Belgium. But Britain was in no hurry to agree on a peace treaty. This week, Maurice Joyce and Stuart Spencer tell us about how the War of Eighteen Twelve ended. British forces were planning several campaigns in the United States later in the year. Successful military campaigns could force the United States to accept the kind of treaty Britain wanted. 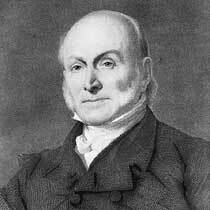 United States representatives were led by John Quincy Adams, son of former president John Adams. They made equally tough demands. The United States wanted payment for damages suffered during the war. It also demanded that Britain stop seizing American seamen for the British navy. And the United States wanted all of Canada. The British representatives said they could not even discuss the question of impressing Americans into the British navy. 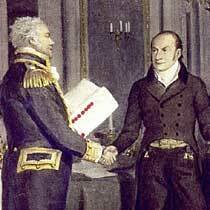 John Quincy Adams had little hope the talks would succeed. The Americans would surrender none of their territory. Old John Adams, the former president, told President James Madison: "I would continue this war forever before surrendering an acre of America." His son, John Quincy, did not believe the British would reduce any of their demands. But another of the Americans at Ghent, House Speaker Henry Clay, felt differently. Clay was right. After Britain received word that its military campaigns had failed at Baltimore and Plattsburgh, its representatives became easier to negotiate with. They dropped the demand that the United States give the Northwest Territory to the Indians. Britain still hoped for military successes in America. The British government asked the Duke of Wellington to lead British forces in Canada. The duke had won important victories in the war against Napoleon. Perhaps he could do the same in America. The duke was offered the power to continue the war or to make peace. Wellington told the government he would go to America if requested. But he refused to promise any success. He said it was not a new general that Britain needed in America, but naval control of the Great Lakes that separated the United States from Canada. "The question is," Wellington said, "can we get this naval control? If we cannot, then I will do you no good in America. I think," said Wellington, "that you might as well sign a peace treaty with the United States now. I think you have no right to demand any territory from the United States. The failure of the British military campaigns in America gives you no right to make such demands." Detail of Amedee Forestier's "A Hundred Years Peace. The Signature of the Treaty of Ghent between Great Britain and the United States of America"
The British government accepted this advice from its top military expert. It ordered the British representatives at Ghent to drop the demands for American territory. The Americans then dropped their demands for Canadian territory. The things that led to the war no longer existed. Britain's war with France had caused the British and French to interfere with neutral American trade. And Britain had needed men for its navy. Now, the war with France was over. No longer was there any reason to interfere with the trade of any nation. And no longer was there any need to seize Americans for service in the British navy. On the day before Christmas, eighteen fourteen, the United States and Britain signed a simple treaty. In it, each side agreed to stop fighting. They agreed to settle all their differences at future negotiations. During the autumn of eighteen fourteen, British soldiers at Jamaica began preparing for an attack against New Orleans, at the mouth of the Mississippi River. Late in November, this force of about seven thousand five hundred men sailed from Jamaica to New Orleans. The British soldiers were commanded by General Sir Edward Pakenham. The general did not take his men directly to the mouth of the Mississippi River. Instead, they sailed across a lake east of the city. Early during the afternoon of December twenty-third, General Andrew Jackson, the commander of American forces at New Orleans, learned the British force was near. General Jackson was a good soldier and a great leader of men. He fought in the Revolutionary War, then studied law. He moved west to Nashville, Tennessee. The general also served in both houses of the United States Congress. When war broke out in eighteen twelve, he was elected general of a group of volunteer soldiers from Tennessee. Jackson was a rough man. His soldiers feared and respected him. They called him "Old Hickory," because he seemed as tough as hickory wood. Jackson was given responsibility for defending the Gulf coast. Earlier in the year, he had attacked Pensacola, in east Florida, and forced out several hundred British marines. 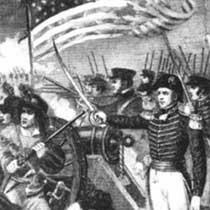 Jackson believed the British would attack Mobile before attacking New Orleans. He left part of his forces at Mobile and took the others to the mouth of the Mississippi. Jackson had chosen this place carefully. On the right was the Mississippi River. On the left was a swamp -- mud and water that could not be crossed. In front of the American soldiers was an open field. Finally, on January eighth, the British attacked. They expected the Americans to flee in the face of their strong attack. But the Americans stood firm. Jackson's artillery fired into the enemy. When the British got as close as one hundred fifty meters, the Americans began to fire their long rifles. The rain of bullets and shells was deadly. General Pakenham was wounded twice and then killed by a shell that exploded near him. Only one British soldier reached the top of the American defenses. The British finally retreated. They left behind more than two thousand dead and wounded. Five hundred other British soldiers had been captured. Thirteen Americans were killed. It was a great victory for the United States, but one that was not necessary. The war had ended, by treaty, two weeks earlier. ANNOUNCER: Our program was written by Frank Beardsley. The narrators were Maurice Joyce and Stuart Spencer. Join us again next week for THE MAKING OF A NATION – an American history series in VOA Special English. ---The United States declared its independence from Britain on July fourth, seventeen seventy-six. ----Next, the Continental Congress had to decide when the states would choose a president. It agreed on March fourth, seventeen eighty-nine. Is it the National Day of the United States?--- and the second war between Britain and the America ended in 1812. the America did experience chaos.